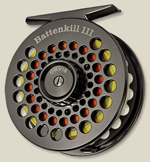 There has been a long and historically successful line of Battenkill reels through Orvis history. Simple, trouble free, and easily accessible in price-the ultimate in function and simplicity throughout the years. 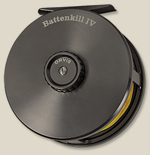 Welcome to the powerful, technologically advanced, and yet still accessible new generation of Battenkill reels. This latest Battenkill Disc version is true to its heritage in looks and performance, but updated with the latest in design improvements and a significantly more powerful drag. 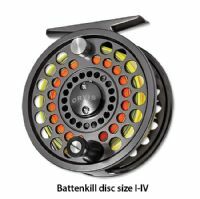 The porting and finish pay unmistakable homage to the Battenkills of the past, but this reel incorporates our best-selling mid-arbor design. Underneath that mid arbor is the same sealed drag system found in the Hydros SL incorporating six interacting carbon and stainless drag surfaces. Positive click drag is simple and easy to adjust. The reel is built of 6061-T6 aircraft aluminum with an ergonomic Delrin handle and changing from left to right hand retrieve is simple. In black nickel. Imported.